One Ukrainian soldier was captured in December 18 Svitlodarsk fray. 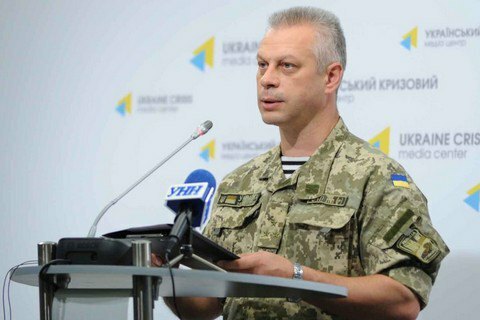 Over the past day, two Ukrainian soldiers were killed, four wounded and another four were shell-shocked in Donbas combat zone, the press officer on the ATO Col. Andriy Lysenko told a briefing on 21 December. He added that one soldier was captured during a clash with the militants on December 18 in the area of Svitlodarsk. On Tuesday the enemy continued continued shelling in the area of the so-called Svitlodarsk bulge. From morning to afternoon, the militants carried out a series of artillery and mortar shelling and made an attempt of assault, which was repulsed. After the failure of the attack, the enemy until the end of the day has waged five armed provocations, using grenade launchers of various systems. The industrial zone of Avdiyivka was the hot spot after sunset on Tuesday as he enemy fired light weapons and mortars. In the Luhansk sector, the district of Popasna took the lion's share of enemy attacks. The separatist forces extensively used light weapons, including sniper fire, and mortars. Stanytsya Luhanska and Syze saw one attack each. In the Mariupol sector, the number of attacks dropped by half (from 27 to 13) over the previous day, but the intensity of fire continued. The enemy used heavy weapons, including 120mm mortars and 122 mm artillery. It was almost quiet in the south of the sector where Ukrainian positions were shelled fore times compared with more than twenty on Monday. In the meantime, the enemy intensified fire on the ATO positions west of Dokuchaivsk. During the day, the militants fired over 60 mortar projectiles at ATO positions, repeatedly used armored vehicles and fired small arms. The village of Krasnohorivka was shelled from mortars and grenade launchers. On Monday, December 19, one soldier was killed in combat, nine were injured and eight were shell-shocked during the shelling in the area of Svitlodarsk bulge.